is caused due to damage to the inner ear. The actual cause lies in interference with the normal ion-water homeostasis in the ear that leads to several inner ear diseases. Vertigo is more common in females and in elderly. Some of the causes of vertigo are listed as below. 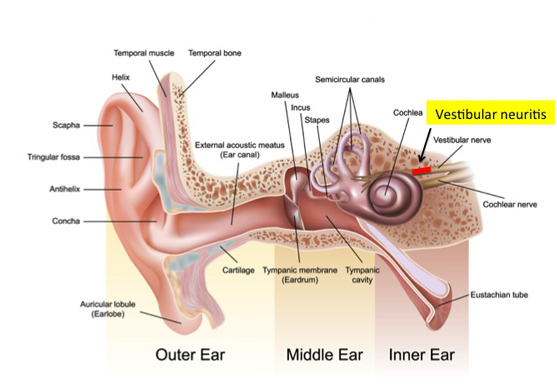 Benign paroxysmal positional vertigo or BPPV is the most common cause of vertigo that occurs due to presence of minute calcium particles known as canaliths in the canals of inner ear. These canaliths cause problem when they enter any of the fluid filled channels in the ear which may occur on sudden movement of head like sudden standing up, turning the head, lifting up the head etc. It is a recurrent condition that may occur in short and tense bouts. It is often accompanied with nausea and vomiting. It is a benign condition that occurs on positional change in the body and sometimes also accompanied with nystagmus. Vestibular neuronitis is a condition associated with the inflammation in the inner ear due to viral infections like cold and flu. This inflammation affects the nerves that sense the balance of the body thus leading to vertigo. It may last for a few hours to a few weeks. Labyrinthitis is the inflammation of the labyrinth which is a delicate network of fluid filled channels in your inner ear and a controller balance and hearing. Due to its inflammation, the signs sent to brain are abnormal and leads to the imbalance of body. It may also be associated with nausea, vomiting or pain in the ear. Meniere’s disease is a rare disorder in the inner ear which is caused by the viral or bacterial infection leading to the accumulation of fluid and thus exerting pressure in the ear. It is often associated with tinnitus, aural fullness as well as loss of hearing. 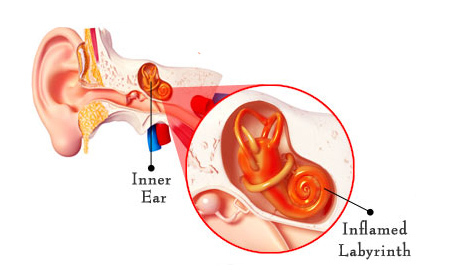 Immune mediated inner ear disease is an autoimmune reaction may also lead to damage of ear which further is associated with vertigo, tinnitus and hearing loss. Migraine headaches are characterized by severe throbbing type of pain in front of or on one side of the head. It is also accompanied with dizziness, nauseatic feeling, vomiting and photophobia. Concussion or injuries in head and neck region that may lead to disorientation of the fluid in the ear canals leading to imbalance or dizziness. Nerve demyelination or acoustic tumors in the brain is a benign neuroma of the acoustic nerve that aids hearing and balance in the body. Medications: There are a few medications that may lead to dizziness. Thus it is important to read the adverse effects of each medicine carefully before consumption. Spinning or childhood rotation games is common in children who may feel dizziness or spinning of head after playing such games. Alcohol: Excess consumption of alcohol also leads to vertigo. Cerebellar vascular lesions or other lesions in the brainstem may also be associated with vertigo. Even the multiple sclerosis affecting the spinal cord causes vertigo.